The big question on a lot of people's minds is: Will the removal of the eastern population segment of Steller sea lions from the Endangered Species List open the door to the eventual selective sea lion killing at Bonneville Dam in a program similar to the one in place for California sea lions? Potentially, said Robin Brown, the Marine Mammal Project leader with the Oregon Department of Fish and Wildlife. But the decision about whether to pursue that option is years away, and the decision about whether to pursue it will have to be made at the highest levels, he added. "It does change that," he said about the delisting. "Basically because the statute in Section 120 of the Marine Mammals Protection Act, which provides the authority that we are using to remove predatory California sea lions at Bonneville Dam requires that the animal ... cannot be listed under the Endangered Species Act if you want to apply for that authority. So that does provide, potentially, for the authority for management if necessary in that case." Officials with National Oceanic and Atmospheric Administration Fisheries on Oct. 23 announced a finding that the eastern population segment of the huge marine mammals was healthy and growing, and that federal protection no longer is required. The delisting becomes official 30 days after it is published in the Federal Register. "The delisting is really an appropriate action," Brown said about the eastern segment population of Stellers estimated at 70,174 in 2010, up from 18,040 in 1979. That segment stretches from Cape Suckling, Alaska, down the West Coast to the Channel Islands off the coast of Southern California. The western population segment of Steller sea lions that extends from Cape Suckling west to the Aleutians still is listed under the ESA. Oregon, Washington and Idaho got the authority for the removal of California sea lions at Bonneville in March 2008. Through 2012, the states removed 54 California sea lions, 11 of those sent to zoos and aquariums. Along the way there were endless legal challenges, something that could be expected with Stellers, albeit with the court challenges ultimately decided in the states' favor under their belts in the case of California sea lions, Brown said. 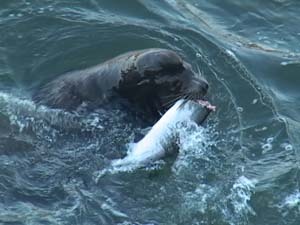 "The idea behind the program was to go at it as hard as we could for five years and get as many of the dominant predators out of there as we could and then have the information to evaluate the effectiveness of the program and see if it was appropriate to continue with it or not," he said about removal of the worst offending California sea lions. "With the litigation, the constant litigation, we were just interrupted over and over again. "We lost all of 2011 due to litigation removing the authority, and in the first year we lost several months, and so on and so forth." The one immediate advantage to the delisting of eastern segment Stellers is that it removes one hoop that states have to jump through to get the required permits for monitoring and data collection, Brown said. "With the animals listed that just added another complicating layer to the permit authorization," he said. "So not only do we have to meet all of the objects of the Marine Mammal Protection Act for permitting, we also had to have an ESA consultation to make sure that what we're proposing to do would not have a negative effect on Steller sea lions with respect to the ESA. "So this go-around, because they're not listed, should be a lot easier to get through the review and approval process."